Indianapolis (September 2017) GreenLight Collectibles is excited to announce its newest licensing agreement with BIGFOOT 4×4, Inc. - Monster Truck Racing Team. The founder of The Original Monster Truck, BIGFOOT® #1®. This gives the die-cast replica creator the opportunity to bring to life a highly anticipated release for collectors everywhere – the first die cast BIGFOOT #1. The story of the BIGFOOT monster trucks and their creator, Bob Chandler, truly is a personification of the American dream. What started out as an ordinary Ford F-250 would later become a behemoth truck featuring military axles, 48” tall tires and a souped-up 460 c.i. big block V8 engine that was growing in popularity beyond the Midwest, earning its title as a “monster truck” by the press. BIGFOOT #1 is only the beginning for this new relationship between Greenlight and BIGFOOT 4×4, Inc. Director of Licensing and Product Development Nick Radivan said, “What better way to release the company’s first monster truck die cast than with BIGFOOT #1 – The Original Monster Truck. We’ve partnered with BIGFOOT 4×4, Inc. to bring all things BIG to our lineup! 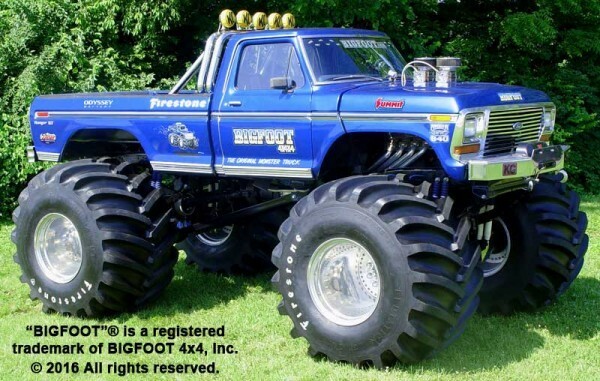 BIGFOOT, The Original Monster Truck, originally created by Bob and Marilyn Chandler as a promotional tool for their 4-wheel drive business, has been named one of the “Top 5 Marketing Vehicles of All Time.” Its worldwide notoriety led to the creation of a family of BIGFOOT monster trucks, and spawned the entire Monster Truck industry. The BIGFOOT fleet has captured 45 National Championships, set numerous world records for monster trucks, and travelled to more than 26 countries. Since 1975, more than 20 BIGFOOT vehicles have been constructed, and today the team campaigns 9 full-time mostly in North America. The team achieves more than 4 million live impressions each year and between 700 and 800 appearance days per year. 3 million BIGFOOT toys were sold in 2014 and 2015. In late 2016, BIGFOOT appeared in probably its most exciting and inspirational events yet – 2 set of Car Crushes in Kuwait at a US military base for the troops as part of the Armed Forces Entertainment/Summit Racing Equipment/NHRA Exhibition BIGFOOT Tour. Visit the team online at www.bigfoot4x4.com.